A new research has revealed that living in a high-rise flat could be the secret to a long and healthy life. New research shows the higher the floor you live on, the greater your life expectancy. Experts at the University of Bern in Switzerland found the chances of dying from serious lung disease was 40 per greater among residents who lived on the ground floor compared to those with a flat on the eighth floor or above. For heart disease, mortality rates were 35 per cent greater among those at ground level and for lung cancer the risk of death increased by 22 per cent. The only type of death where living higher up was associated with increased rates was suicide. Ground floor inhabitants were almost 60 per cent less likely to kill themselves by jumping. The findings, published in the European Journal of Epidemiology, come from a study of more than 1.5 million people living in buildings with four or more floors. Researchers investigated death rates because housing is recognised as a major influence on health. It's estimated that one in six European dwellings is located in a high-rise building. In the UK, many of these tower blocks sprung up in the sixties and seventies, often in deprived areas. But modern versions tend to be aimed at the luxury end of the market where rents rise in accordance with the level flats are situated on. 'The reputation of high-rise housing as unpleasant and unhealthy habitats that isolate people from their social environment and increase crime continues to the present,' the researchers said in a report. Between 2000 and 2008, the researchers identified a total of 142,390 deaths among tower block residents in Switzerland. Overall, those on the ground floor had a 22 per cent greater chance of dying earlier from all causes than those in flats eight floors up or more. Lung and heart-related conditions were the most likely cause but there was no apparent link with cancer. One reason may be that high-rise residents are more likely to use the stairs, which could keep them fit and protect against heart disease. But air pollution and traffic noise at ground level could also be a key factor, the researchers warned. Wealthy high-rise occupants are also more likely to look after their health, they said. However, they stressed findings taken from people living in one of the richest nations in the world may not necessarily apply to poor parts of the UK. "Clearly, our results are not applicable to tower blocks in deprived areas of Glasgow, where high-rise housing tends to be in poor condition," they told Dailymail UK. However, living the high life is not always best for your health. One study from Spain showed apartments in the sky are one of the worst places for getting hay fever, with rates considerably higher than in people living in the countryside. In Nigeria, some facility managers were cautious in making in comments. Akin Olawore, an estate surveyor and valuer, said, climbing the stairs is good for the lungs. 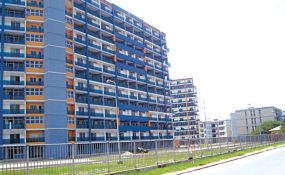 The President - Africa, International Real Estate Federation (FIABCI), Chudi Ubosi and former President of the International Facility Management Association (IFMA), Nigeria Chapter, Stephen Jagun, said they are hearing about it for the first time.